Good Start Packaging is an e-commerce company. 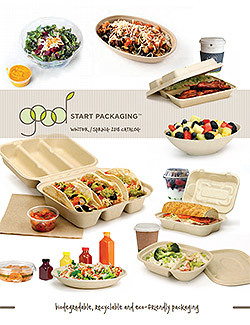 Our goal is to make it easy for food service companies of all sizes to have access to compostables. You can order as much or as little as you need, whenever you want. No contracts. No minimum spend. You are able to browse our entire inventory of products and find pricing on our website - including bulk discounts - and place your orders online. Note that while our catalog contains our products along with lots of photographs and food inspiration, it does not contain pricing. Our wholesale prices can only be found on our website. Select a category to your left to start shopping.